DENVER -- Russell Means, in this interview in 2008, points out the United States has been in perpetual war -- in war every year -- and the people do not even realize it. Means said the United States is a sham where Indigenous Peoples have no rights, in an interview with Govinda Dalton at KMEC, Mendocino, Calif., now archived at Earthcycles. 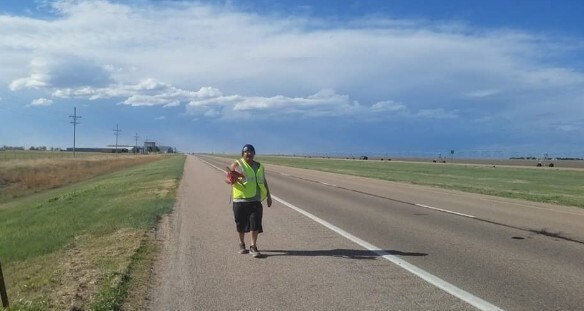 Means, chief facilitator for the Republic of Lakota, describes the events at the Democratic National Convention in Denver in 2008, beginning with the anti-war march he participated in. The anti-war march was headed up by about 50 servicemen in uniform. "They marched all the way to the DNC Convention Center." The DNC allowed one of the uniformed soldiers to go inside and address their grievances and desires. "They were willing to be arrested." They were willing to march through the police line and be arrested, but cooler heads prevailed, he said. "I'm not a fan of the Democrats or the Republicans." "It is virtually impossible to guarantee your rights under a two party system." "You have a one party system, the Republicans, and the weak-kneed Democrats." "Make no bones about it, America is about the elite who rule." Means said it is impossible for the Indigenous People to be heard. He said colonialism is the only explanation. "Colonized tribal governments are demeaning and disorganized." "They are there expressly so that we never realize our potential." "Americans have to understand their Constitutional rights." "You are free to be responsible." Americans have become a joke to the world, he said. The U.S. imperialism is based on the U.S. military. Means pointed out that the United States has been at war every year of its existence. "The people don't even realize it." "This country is a sham." Referring to a slogan, he said, "If voting could change anything, it would be illegal." Then referring to Einstein's words, he said, "The definition of insanity is doing the same thing over and over again, but expecting different results. Orwell recognized what was going on in the 1940s, and his later book became a best seller, he said. 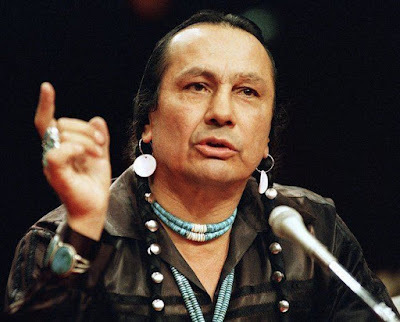 Russell Means' words speaking out against the United States and war, are a reminder that Martin Luther King, Jr., led anti-war efforts against the Vietnam War, during the final years of his life, before he was assassinated. Thank you to Govinda Dalton, founder of Earthcycles and Spirit Resistance Radio, for his tireless efforts of interviewing and archiving these great historical records.